The bridge project has come in for fierce criticism in Hong Kong, where there was little public demand or appetite for greater links to either Macau or Zhuhai, and fears the city will be swamped by tourists from mainland China. For critics of the Chinese government, the bridge is seen as a tool to drag the city -- which boasts a semi-democratic legislature and independent judiciary and has seen numerous mass protests in recent years -- closer into Beijing's grip. "You can't see the existing transport connections -- in a literal way. 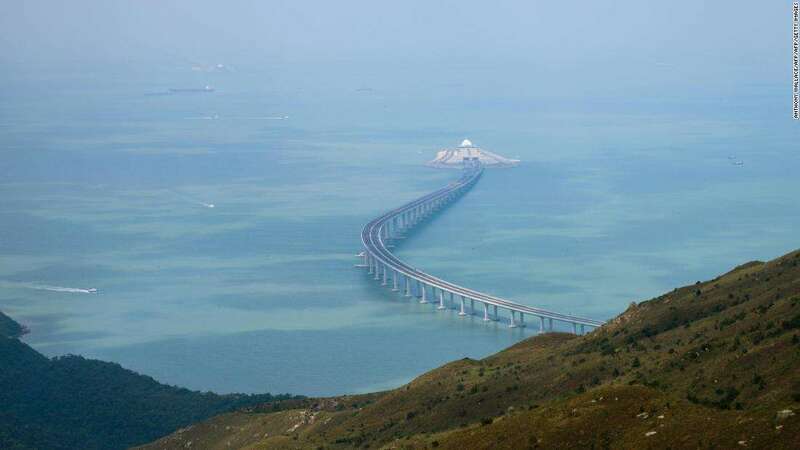 But this bridge is very visible ... you can see it from the plane when you fly in to Hong Kong, and it's breathtaking," lawmaker Claudia Mo told CNN earlier in the year. "It links Hong Kong to China almost like an umbilical cord. You see it, and you know you're linked up to the motherland." Mo and other critics also point to the huge amount of money spent by Hong Kong -- upwards of $9 billion -- while the city is dealing with an acute lack of public housing and widespread poverty. "Hong Kong has had to fund a lot of the bridge, but we won't see many benefits here," Mo said. Built to withstand a magnitude 8 earthquake, a super typhoon and strikes by super-sized cargo vessels, the bridge incorporates 400,000 tons of steel -- 4.5 times the amount in San Francisco's Golden Gate Bridge. Conservation experts previously told CNN they feared the bridge, as well as ongoing expansion of Hong Kong airport, could be the final nail in the dolphins' coffin, sending the local population into terminal decline. In response to environmental concerns over the bridge, the Hong Kong government has provided for the creation of extra marine parks to protect dolphins and other aquatic life, but some experts say this may be too late to reduce the effect of the construction already carried out. The bridge has also faced considerable public criticism over safety standards. Seven workers died in constructing the bridge, and another 275 were injured. Hong Kong officials have previously blamed the death toll on lack of manpower, and earlier this year a court fined several subcontractors over the issue.